Sleep disorders are on the rise due to the hectic lifestyle that we live - the effects are of high magnitude and are often treated with medicine. Ayurveda takes a different approach. Twenty-five percent of all adults occasionally suffer from a sleep disorder and this trend is on the rise. A development that one should reflect on. What lacks in this fast-paced world we live in? Do we only require more rest? It is a fact that sleep disorders are frequently treated with medication. This leads to getting rid of the symptom but not the underlying cause of the problem, which consequently results to a continual intake of medication - not the healthiest solution. Typical symptoms of a Vata disorder are also stiff joints, back problems or constipation. It is best to consult an Ayurvedic physician in such cases, who can observe your individual case and comply perfectly coordinated measures to tackle the problem at hand. In Ayurveda, all times of day has a dosha. At approximately 10 pm kapha time ends and pitta time begins. This means that you should go to bed before 10 pm and best rise before 6 am when the vata time ends. Sleeping during the pitta phase has a positive effect on the body's regeneration when you sleep. In addition, you are able to sleep more easily and throughly. Routine is important. Maintain a regular routine such as retiring for bed the same time everyday and establishing sleep rituals. Following the same routine every evening before bed programs the nervous system to cam itself. Exercise is important for proper sleep. Studies have confirmed that people who exercise regularly sleep better. In addition, the stress hormone cortisol is reduced, which also helps you fall asleep. Yoga trains the body and has a positive effect on the general mood and stress levels. Eat three times a day, preferably at the same time. Refrain from consuming spicy foods in the evening. In addition, avoid any alcohol and caffeine after 5 pm. Only use the bedroom as the space where you retire. Thus, it becomes a sanctuary that keeps the every day chaos and stress out. 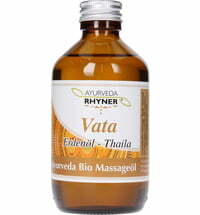 Before bed treat your neck, hands and/or feet to a massage using vata oil or ghee. 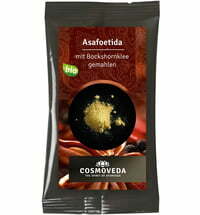 This promotes relaxation which in turn contributes to a peaceful night's sleep. Another great tip is vata tea with licorice, ginger, cinnamon and cardamom as well as warm milk with honey, nutmeg, saffron, cinnamon, ginger or cardamom (not necessarily suitable for kapha). Even herbal teas (fennel, St. John's wort) are a possibility. Meditation can also be used to center your thoughts to regain calmness for improved sleep.